BTW, if you are interested in the parallel part of the workshop, you’ll be glad to know that I’ll also be covering the new cross-platform multithreading support in XE7. Multithreading, regular expressions and attributes, oh my! First day will be completely dedicated to multithreading. We’ll start with basics – why and how – and proceed with TThread-based multithreading on all supported platforms. After lunch we’ll focus more on high-level multithreading with the open-sourced OmniThreadLibrary. A note to participants: I’ll be presenting multiple small problems for you to solve during the workshop. At least you should have Delphi installed on the computer (for best experience it should be one of the latest versions). 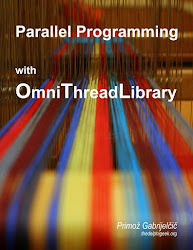 If you really want to come prepared, you can also preload OmniThreadLibrary and if you are trying for the best in class award ;) you can read all about high-level multithreading in advance on the OmniThreadLibrary wiki. The second day will be organized around three topics – attributes, regular expressions and continuous integration. The common point is productivity – in the first two sessions I’ll be showing you how to use some of the incredible power of Delphi to simplify your programming life and in the latter I’ll be focusing on the last stage of any application – building and deploying the release version. Workshop will be held on October 21st and 22nd in Hotel Hesselet in Nyborg.